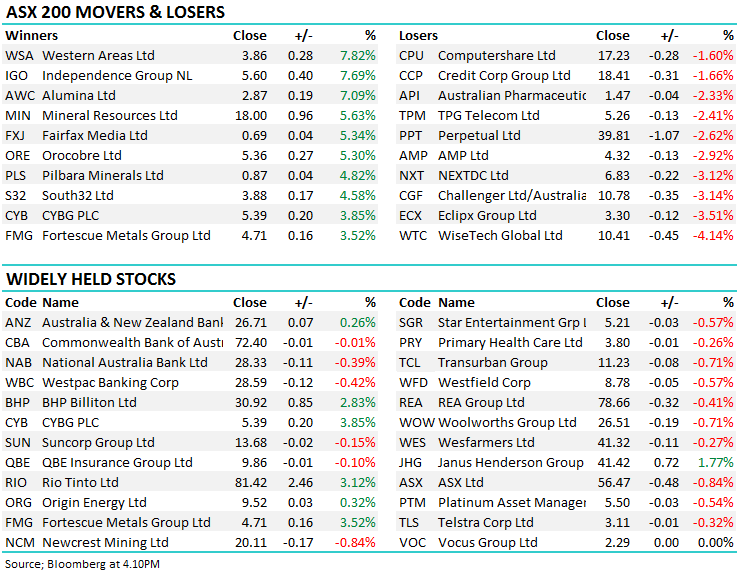 The resource stocks were very strong today after big moves in underlying commodity prices overnight put the fire in the belly of buyers, particularly targeting Nickel stocks Western Areas (WSA) and Independence Group (IGO) which both added more than 7%, while the large caps in BHP and RIO roared around ~3% higher. 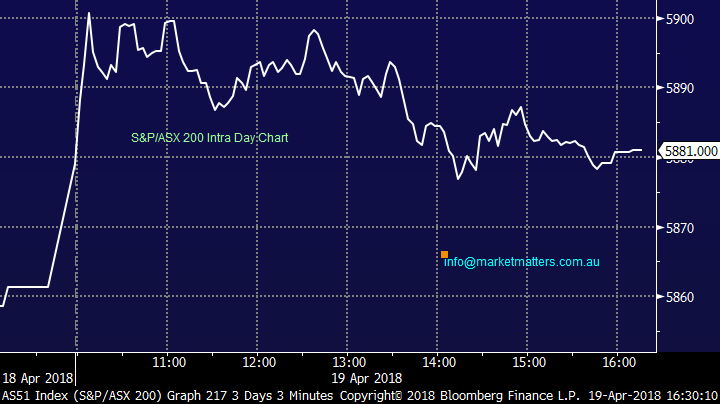 Once again though banks were a no show at the party with three of the big 4 finishing in the red while Bank of QLD continues to suffer from a soft half year result earlier in the week. Iluka & BHP released their first quarter production numbers, while the media space was set alight with rumours of Seven West (SWM) and Fairfax (FXJ) returning to the table for merger discussions – more on these later. Clydesdale (CYB) bounced back in style after yesterday’s announcement on their provisions, closing 3.85% higher while Challenger Group Financial (CGF) came under pressure after their 3rd quarter funds under management update and annuity sales for Q1 were below market expectations – still hit by 3.14% to close at $10.78. Local employment data showed a slight dip in the participation rate but the actual unemployment rate remained unchanged at 5.5%. 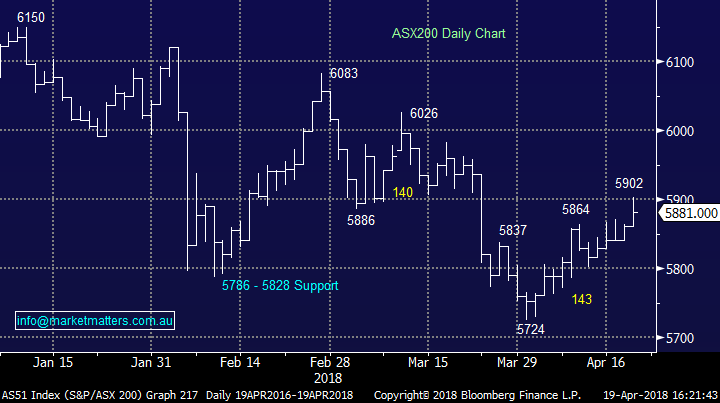 Overall, the index finished 20 points higher, to 5881, up +0.33% - a brief push into the key 5900 range wasn’t held with the market finishing 21 points from highs. It seems the biggest dynamic in the market right now is the growth story – with tech related growth in the US leading the charge there while growth orientated resource stocks have been setting the pace locally. This was a theme we flagged in the Weekend Report suggesting that; Looking at the flow of buying in the US last week, it was clearly targeted mostly towards the technology stocks while locally the market was keen to buy Resource stocks. It’s interesting to think that the two respective ‘growth’ sectors or areas that usually do well when optimism is high saw most love last week. This provides a subtle indication that risk appetite is returning, and the tilt back up towards all-time highs for key US indices is still well and truly on the cards. Overall more misses than beats – iron ore, coal and conventional petroleum – but some beats from recent laggards – US onshore (just as its approaching sale!) and copper (finally as Escondida ramps up). Earnings outlook – Gains in MQ copper prodn and FY guidance should broadly offset the lower MQ iron ore prodn and eased guidance. And if the coal units can deliver on big JQ expectations then FY numbers still look OK … and that’s before we even think about what the last whirlwind of spot commodity prices may do to future commodity price expectations and earnings. 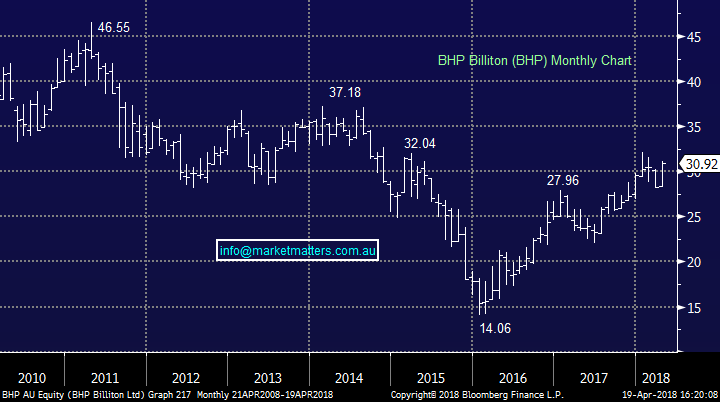 That said the latest M2M for BHP - using spot FX and commodity prices – points to 20-30% earnings uplift. Guidance tweaked with copper group slighter higher (up 1%) on better Escondida performance (we think copper will beat easily) but lowered modestly for iron ore (2%) citing rail/port issues (train unloading unit issues). JQ has to be a big one … In recent months we have gleaned a sense of growing confidence by BHP in terms of 2H18 financial and operational performance. Hopefully this feeds thru into JQ18 metrics which in most cases have to run well above guidance rates (annualised quarterly performance) to hit FY guidance targets i.e. iron ore unit is required to run at an annualised rate in JQ ~8% above FY guidance rate and at a record rate for the business. Ditto a 9% better rate than guidance in JQ from met coal and a whopping 33% better in steam coal. 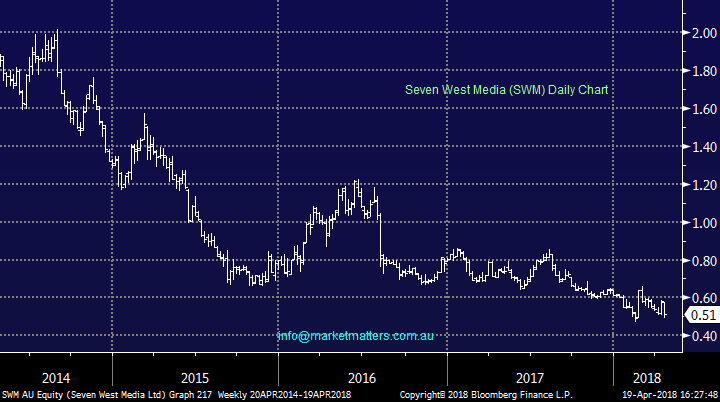 Seven West Media (SWM) $0.51 / +3.03% & Fairfax Media (FXJ) $0.69 / +5.34%; rumblings regarding a $2.3bil merger caused both media giants to rally today. The Australian reported that talks had resumed between the two, after discussions between Fairfax and Nine broke down last year. Seven is under a slight cloud at the moment with rumours of a potential capital raise required to pay for the Cricket rights they picked up last week, which would clearly hurt Seven’s bargaining ability. As this cloud dissipates, the chances of a merger will increase. 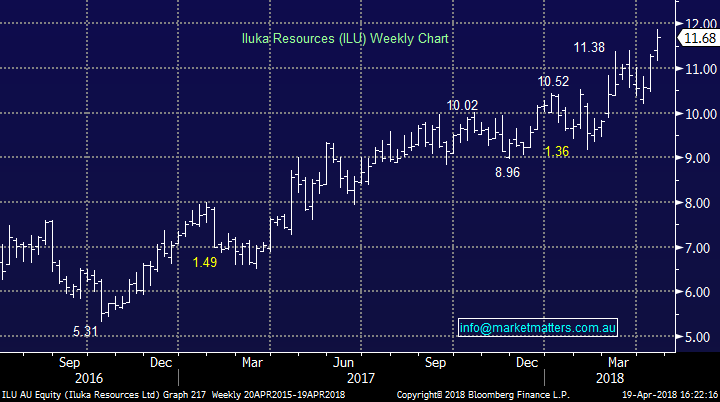 Iluka (ILU) $11.69 / +0.60%; A good set of production numbers today from the Mineral Sands miner plus current price tailwinds are now very much apparent in revenue. Iluka experienced a solid quarter of sales and has seen steady appreciation in prices. Total Z/R/SR sales volumes in the quarter were 205 thousand tonnes, in line with the 203 thousand tonnes sold in first quarter 2017. Sales mix was weighted to high grade titanium feedstock (R/SR), which is consistent with expectations. Weighted average prices for Z/R/SR increased in the quarter from the end of 2017. This reflects the achievement of previously announced price increases for rutile and contractual outcomes for synthetic rutile. The company went on today say that market conditions continue to be strong. The market dynamics remain unchanged, including tight supply in the zircon market and strong demand from pigment producers for high grade titanium feedstocks. They also maintained full year production guidance. We took a healthy 12% profit on Rio Tinto in the Platinum Portfolio today, increasing cash levels to 13%. Strong BUY in resources is STO even with the Harbour bid which adds NO value to the Santos balance sheet. The offer should be rejected by any measure of future values to LNG etc. Santos is generating very strong cash flows and and exceeded forecast in reducing debt to net $2 bln by year end. Harbour will load STO with more debt which will be serviced by Santos increasing cash flows. Any sane analysis should consider Harbour bid a totally opportunistic offer with zero benefit to shareholders on even a short term basis.